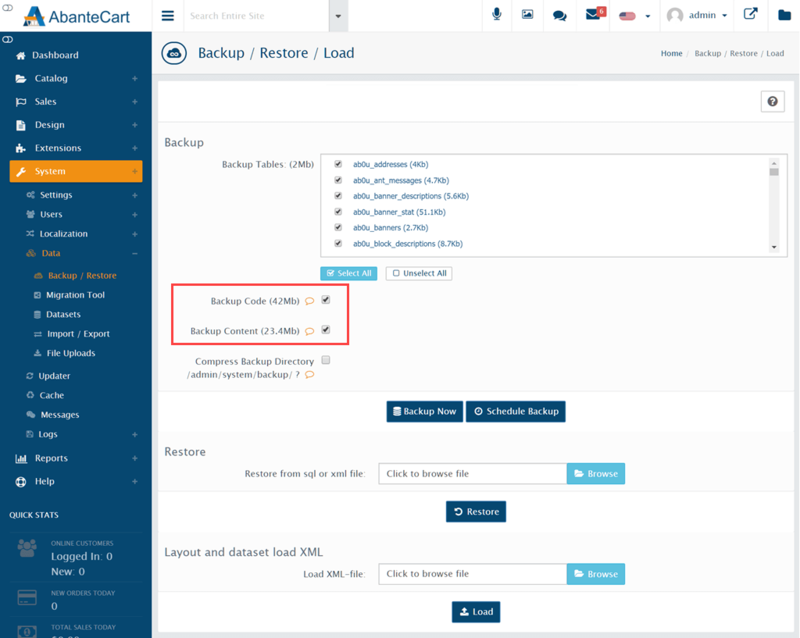 When making significant changes to your online store, or as part of a regular data protection regime, it’s a great idea to take advantage of AbanteCart’s integrated backup and restore feature. AbanteCart administrators can create a full or partial backup of their store from the administration dashboard, or alternatively, use backup features available in cPanel. 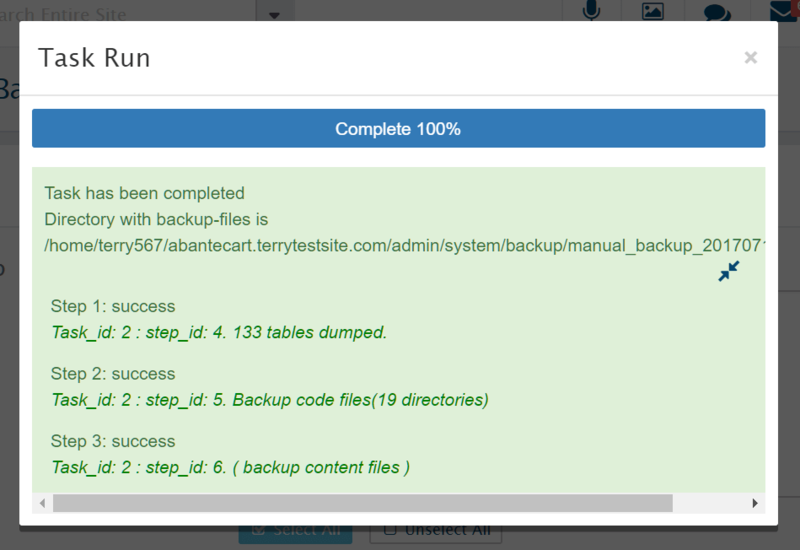 In the AbanteCart administration dashboard, head to System > Data > Backup / Restore to get started. The Backup section is used to create a copy of your store’s database, to be saved to your local computer in SQL format. Use the Backup Tables checkboxes to select which database tables to back up, or alternatively, click the Select All or Unselect All buttons as required. To back up your AbanteCart files and content (such as image files, downloads and other resources) ensure that the checkboxes next to Backup Code and Backup Content are checked. Check the Compress Backup Directory box to create a downloadable tar.gz archive of your files. Click Backup Now to perform the backup immediately, or Schedule Backup to create a recurring backup task. 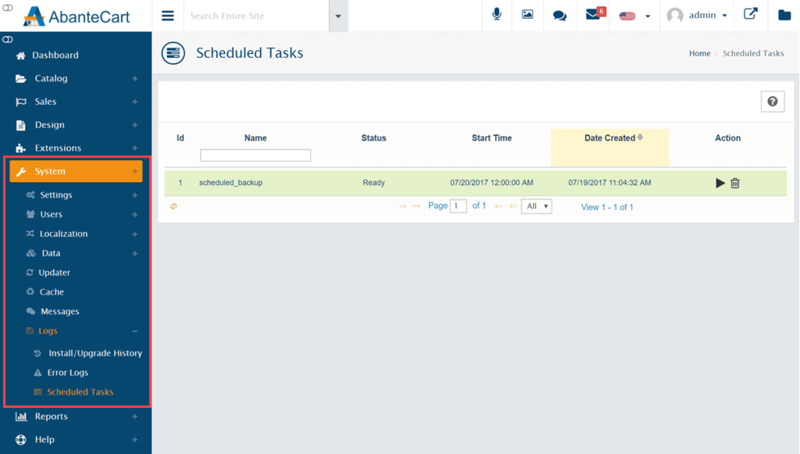 You can view and manually run your scheduled tasks by navigating to System > Logs > Scheduled Tasks. Depending on the size of your store, the backup process may take several minutes to complete. If you find that the backup process stalls, it is likely that your server has insufficient resources to complete the task. Please open a support ticket from your HostPapa Dashboard to request help. To retrieve your archived files, visit Admin > System > Logs > Install/Upgrade History where you can view the location of the archive on your server. You can download the archive to your computer using an FTP client or via cPanel File Manager. The archive will be saved in the tar.gz format. Mac users will be able to extract the file using Finder, while Windows users can use free archiving software such as 7-Zip. To restore a full or partial backup of your AbanteCart store, ensure you’re working with an unzipped backup folder and navigate to System > Data > Backup / Restore. In the Restore section, select the Browse button and navigate to the dump.sql file stored in the backup folder on your local computer. Click the Go button to continue restoring your AbanteCart database. To restore your AbanteCart files and content, use an FTP client or cPanel File Manager to overwrite the contents of your AbanteCart installation. Upload the archived content held in the code folder of your archive. While AbanteCart’s integrated backup feature is the easiest method for protecting your store’s data, advanced users can also back up AbanteCart using standard command line tools. 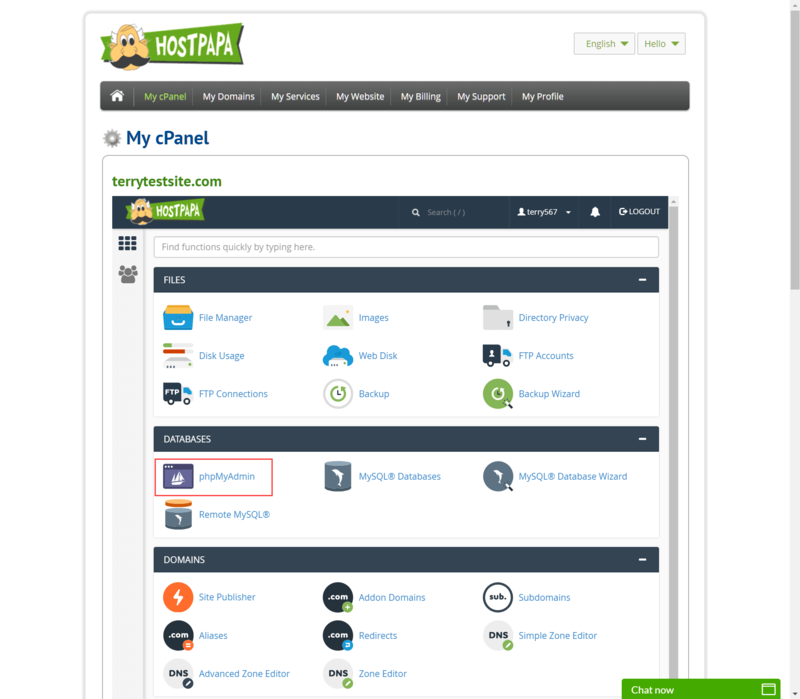 You can also use standard cPanel features to back up your AbanteCart installation. 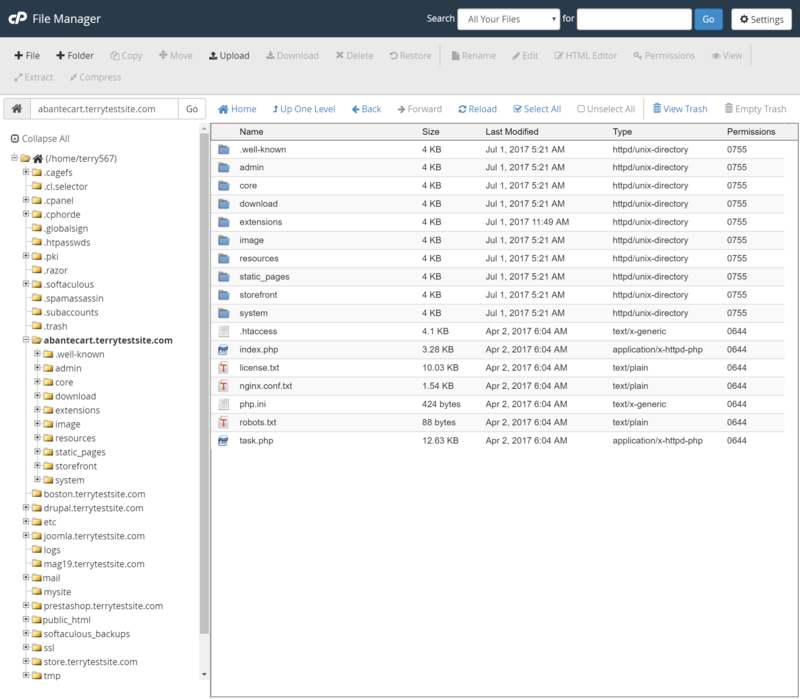 Log in to your HostPapa Dashboard and use cPanel File Manager to download a copy of your AbanteCart files and folders. Once complete, return to My cPanel and select phpMyAdmin from the Databases section. 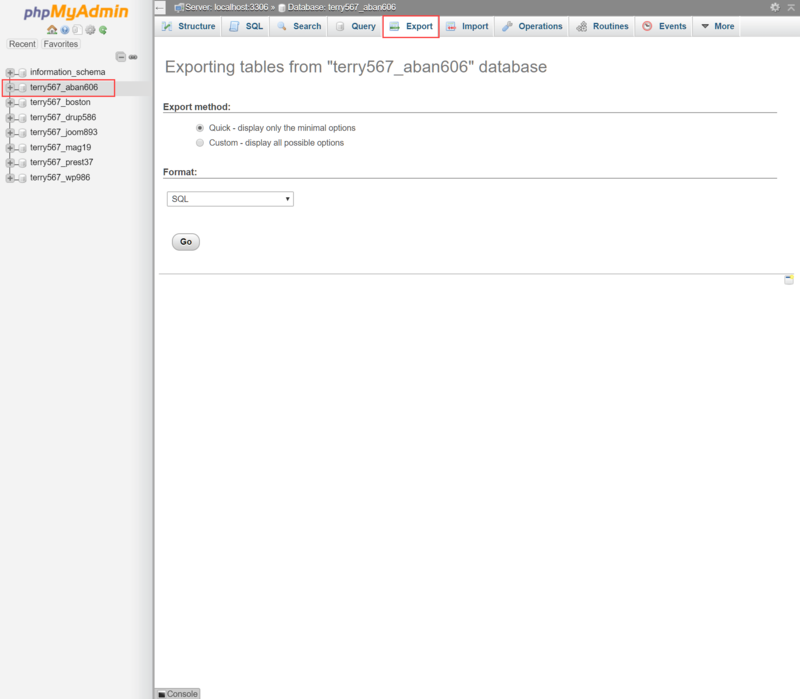 Select your AbanteCart database in the left sidebar and, in the main pane, click the Export tab. Ensure that SQL is selected in the Format dropdown menu, then click the Go button to back up the database.